[Updated] The deadline for nominations for OBA Leader and OBA Chairperson is set at noon today [Oct 1], so who exactly will be standing for the two positions should be confirmed by this afternoon. This process follows after the changes within the OBA over the past few days, which includes the resignation of Jeanne Atherden as OBA Leader and the resignation of Justin Mathias as OBA Chairperson. Following Ms Atherden’s resignation, Leah Scott has been serving as the Acting OBA Leader, while Craig Cannonier has already been sworn in as Opposition Leader, as while they are often regarded as the same, the OBA Leader and Opposition Leader are not, technically speaking, exactly the same, as the OBA leader is selected by the party, while the Opposition Leader is officially appointed by the Governor. The position of OBA Leader is open to any of the the eleven OBA MPs, and Mr Cannonier has the support of the majority of the MPs and is widely expected to submit his nomination for Party Leader. If there is only one valid nomination for the posts, that person will be declared the winner, however should more than one person put their name forward for either of the posts, the OBA will hold the election on October 12th. We will update this article after noon today with the candidates – and if only one person submits, the winner — for both positions. 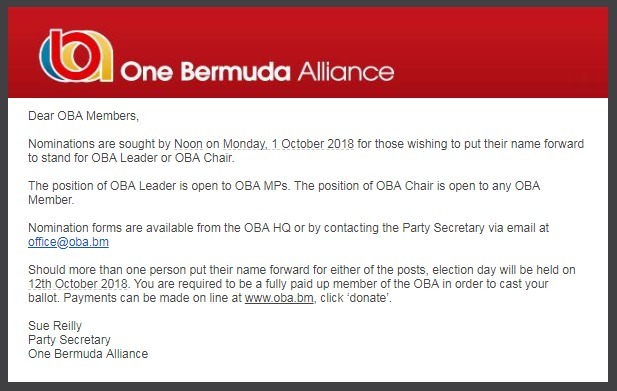 Update 11.34am: In response to our queries, Michael Dunkley said, “There has been a great deal of speculation on whether I would put my name forward during the nomination period to be the leader of the One Bermuda Alliance. After a great deal of pressure, support and consideration I have decided not to submit a nomination. “The OBA has gone through a difficult period since the last election – many opposition members have not been effective to this point and there has been a leadership change. “I have served in many leadership positions and with my experience and at this point in life it is not always necessary to be the focal leader. 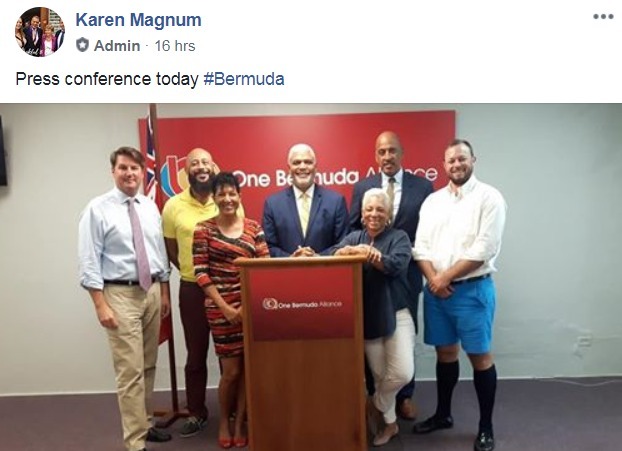 I can use my experience, ability and enthusiasm in other ways and I am willing to work with my colleagues to do what is required for the OBA and Bermuda. As only OBA MPs can stand for leader, it is now all but guaranteed that Mr Cannonier will be appointed as OBA Leader by acclamation today. Update 12.41pm: The OBA has confirmed that as no other nominations for the post of OBA Party Leader were received by the noon deadline today, Craig Cannonier becomes the Party Leader by acclamation. Two nominations for the Chair were received – Simone Barton and Nandi Outerbridge – and there will be a special general meeting on October 12 to elect a new chair, the OBA also confirmed. “The time has come for the OBA to stand as a party in its own right,” said Mr Cannonier. “While we cannot, and should not, ignore past successes, the OBA has to change course and carry on what it started in 2012. “Over the next few days, I will announce my full Senate team and my Shadow Cabinet, and the direction of the Party will become abundantly clear. “This OBA will be the Loyal Opposition that our country needs and, in time, we will be the Government that our country expects. Update Oct 2, 12.40pm: According to a post by an admin on the OBA Facebook page, a press conference was apparently held yesterday. Pictured below, left to right, OBA MPs Scott Pearman, Sylvan Richards, Susan Jackson, OBA Leader Craig Cannonier, Deputy Leader Leah Scott, Cole Simons and Senate Leader Nick Kempe. Pay attention my people something is really odd when you see the 5% of black members trying to control a party that’s 95% white voters. What did C V Jim Woolridge say in his book? I can see that he wasn’t a lier now. Its called de Surrogate factor. I would be highly surprised if anyone challenges Cannonier. 8 of the 11 MPs already signaled their support. The other 3, Atherden, Dunkley and Moniz are unlikely to have any traction, although Dunkley would probably like to. I believe Cannonier will be rubber stamped as Leader. The membership should feel pressured into selecting him as the Parliamentary group basically took the power from them. Not a great way to start out. Last I checked Craig was the class clown not Mr Dunkley. Dirty politics is I see from Craig and the entire gang of eight. This is why the PLP won the last election because of the dirt the OBA continues to let control the party. You will fail in the next election. This time it will be the white Bermudians staying home. Craig Cannonier has at least won a General Election, something the Milkman will never do. Craig Trump only won because a certain segment of voters stayed home. The man is crazy if he thinks the people will flip flop back to the oba/UBP because he claims to be in charge. He going to be toast next election than the party will toss him out again. I wouldnt count on it, all they need is a good propaganda platform and a PLP Minster or Leader do something outragously stupid and they would capatilize on it until swing voters gooble it up and forget about the 4 years of hell they went through. You must be a PLP supporter! We are all responsible collectively for the downfall of the BOA. Next election, if there is no better candidate than “less than transparent Cannonier” STAY HOME! If I were an OBA member I’d be VEXED!!!! Its healthier and very popular in the UK online, £1 per fluid ounce. Move on, its played out. It’s time to step up and do the job that Dunkley , Grant , Bob , Trevor and others prevented you from doing BECAUSE THEY WERE HOLDING YOUR HAND .Be the Man. No matter how much wealth or real estate they accumilate, you will always be a disgrace to the Black Community for supporting those who legislate policies against us.